A new study published this week in the American Journal of Clinical Nutrition reports that long-term consumption of the saturated fat found in full-fat dairy products is not associated with an increased risk of cardiovascular disease (atherosclerosis, coronary artery disease, etc.) or other causes of death, and may actually be protective against heart attack and stroke. The study which took place over almost a quarter of a decade measured three specific fatty acids found in dairy products in 2,900 older adults, aged 65 years and above— first in 1992, again in 1998 and finally in 2015 . The three fatty acids they measured were pentadecanoic, heptadecanoic, and palmitoleic acids. During the 22 year period, 2,428 of the participants died of which 833 were due to heart disease. When the data was analyzed, none of the three fats was associated with the risk of total mortality (death) or heart disease — in fact, high levels of heptadecanoic acid was associated with a lower risk of death from heart disease and stroke. This is significant because while higher amounts of saturated-fat consumption, including the saturated fats in this study increase blood LDL cholesterol, they also increase HDL cholesterol and decrease triglycerides, both of which are protective. Since it was unknown what the ‘net effect’ on total mortality (death) and cause-specific death, this study was done to determine what effect, if any increased dairy fats had on these outcomes. Not only did long-term consumption of these three dairy fats have no effect on either total death or heart disease, high levels of one of the fats found in full-fat dairy was actually found to be associated with a lower risk of heart disease and stroke! The results of this long-term study with almost 3,000 older adults demonstrates that the saturated fat found in full-fat dairy is not associated with cardiovascular disease (CVD), diabetes or cancer and may even be protective against both heart attack and stroke. With both the American and Canadian Dietary Guidelines currently being revised— and “front of label labeling” in Canada to advise against foods high in saturated fat, it is time for both the US Office of Disease Prevention as well as Health Canada to review their respective recommendations with regards to consumption of low-fat dairy, in light of current research. Dairy protects play an important role in health and nutrition and are rich sources of calcium, potassium, and phosphorus and are a ready supply protein and essential fat not only to growing children, but to older adults who risk osteoporosis and sarcopenia (muscle wasting). Given the results of this study on the saturated fat in dairy, as well as the results of a recent 158-country study which found that total fat and animal fat consumption were least associated with the risk of cardiovascular disease, it is time to re-evaluate the long-held belief that animal fat (whether in meat or dairy), is somehow ‘dangerous’. I regularly come across people in my practice who grew up in the last 40 years and who have spent their entire lives avoiding any form of animal fat. The very idea of eating the yolk in egg is a source of anxiety — and it need not be so. I am not suggesting that these folks suddenly start eating copious amounts eggs, meat, cheese, cream and butter but often suggest they start with things such as avocado, olives, nuts and seeds that are rich in monounsaturated fats that have been less villainized than saturated fat. I encourage them to use a little cream on top of fresh berries or use a bit of butter to cook with. 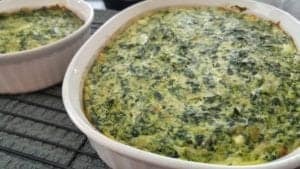 In time, I may show them delightful egg recipes that have other foods they are used to eating and enjoy, such as a spinach-ricotta pie, which makes a lovely summer-time dinner when it’s too hot too cook. Overcoming “fat phobia” takes time — especially when it has been ingrained in you since you’re young. I understand. When we work together, you set the pace. People are sometimes concerned than they can’t follow a low-carbohydrate lifestyle because they “can’t eat all that fat”, but the truth is, not all low-carb diets have large amounts of fat. It’s only because fat has 2 1/2 times the calories as protein and carbs that some types of low-carb diet are still considered “high fat”. There is a whole range of low-carb diets which you can read about here as well as different types of ketogenic (“keto”) diets that you can read about here. Have questions about which type of low carbohydrate diet may be best for you? Or perhaps you have questions about my services and their costs. Maybe you’d just like to meet me for a one-hour consultation (in-person or via Skype) to ask questions and see if this may be an option for you. Please send me a note using the “Contact Me” form on this web page and I’ll be glad to reply as soon as I’m able.